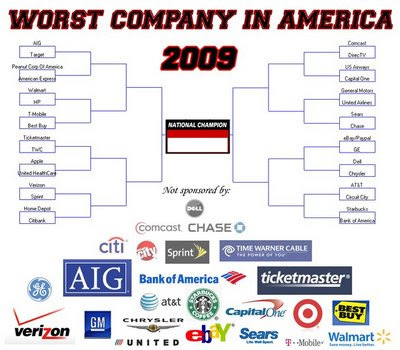 In today's poll at the Consumerist's contest for the Worst Company in America (WCIA), the matchup is Peanut Corporation of America versus American Express. Vote your choice. In the New York Times, Andrew Martin asks whether the new administration and the new ambitions of its allies in the good food movement all add up to a food revolution. Fine interviews with Eric Schlosser, Michael Jacobson, Michael Pollan, and Marion Nestle. Good discussion of Michelle Obama and Kathleen Merrigan. A lasting change in the government's philosophical approach toward food requires winning over the median voter. Any policy changes that move faster toward promoting organic and local than the median voter approves will be reversed with the next political cycle. (1) For policy, focus not so much on new policies to promote organic and local food, but instead on reforms to bad existing policies that face widespread opposition beyond the good food movement. For example, reverse unproductive subsidies for rich farmers, reform ethanol policy, address unhealthy food sales in school, and rein in the federal government's commodity checkoff programs' advertising for beef, pork, and cheese. (2) Don't focus on policy alone. Continue to work the grass roots, making local and organic food ever more appealing, accessible, and economical to a wide variety of people. Continue to think of yourselves as the up and coming industry, not the political party already in power. Does this passage from today's Washington Post make sense? Some bank executives warned yesterday that the government is forcing them toward a disastrous choice between accepting restrictions on compensation that could cripple their ability to compete with rivals, or returning billions in federal aid, which could retard lending and damage the economy. The executives claim their institutions cannot afford to grant bonuses merely in the hundreds of thousands of dollars or low millions, instead of the tens of millions, during a single recessionary year. They claim the result of such small bonuses would be that critical staff would be hired away by competitors who are still willing to pay bonuses in the tens of millions. Who, exactly, are these healthy competitors? They are make-believe. Remember, many competitors also received government money. And, even if healthy competitors existed, and were willing to pay tens of millions to steal talent from the bailed-out institutions, is it wise public policy for the government to say, "No, there is a compelling national interest in keeping these financial talents in failing institutions rather than allowing them to move to healthy institutions"? By any standard except the U.S. standards, I would be considered a dogmatic free market economist. I think it is fabulous to live in a country where everybody respects the power of markets, where labor markets are competitive, and talent is rewarded. It makes total sense to me that financial wizards get paid many times what ordinary working people are paid even in a recessionary year when they are being bailed out by the government. Five times as much. Ten times as much. Fine! But, I just don't believe the incentive structure is really going to fall apart if the federal government prevents these bailed-out institutions from paying 100 times as much as ordinary people make, while at the same time giving these institutions billions of dollars in bail-out money from taxes on those same ordinary people. This isn't U.S. Food Policy, and it isn't my area of expertise. But, in the current environment, all government policy depends on the success of financial recovery policy. I am sure, if I make some newbie mistake, somebody will correct me in the comments. 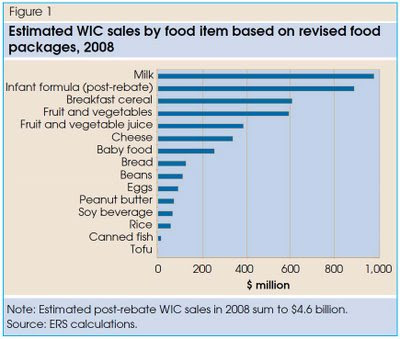 USDA's report on WIC this week estimates that the program leads to about $4.6 billion in annual food spending. Of this, perhaps 26% is "additional" spending that would not have occurred in the absence of the program. Even in the recently redesigned food package, the leading product categories are still milk and infant formula, followed by cereals, fruits and vegetables, and cheese. Because farm sector support is a key part of the trustworthy advocacy coalition behind the WIC program, the computations of farm-level impact are interesting. USDA estimates that $1.3 billion in annual demand for farm products can be attributed to WIC. The full program name is the Special Supplemental Nutrition Program for Women, Infants, and Children. U.S. Rep. Louise Slaughter this week proposed a bill to limit nontherapeutic use of antibiotics in meat production. Sen. Edward Kennedy has proposed similar legislation in the Senate. Nontherapeutic use is the dose of antibiotics routinely given to animals to enhance growth, especially in factory farm settings that bring a high risk of disease. Scientists suspect that such routine use encourages antibiotic resistance in pathogens, which evolve to survive the effects of the medicine. The bill, introduced in the House of Representatives by Louise Slaughter and in the Senate by Edward Kennedy, would ban the use of antibiotics important to human health from being used on cattle, hogs, sheep and poultry unless animals are ill.
Drug manufacturers would be allowed to sell antibiotics for uses other than humans if they can show there is no danger to public health from microbes developing resistance to them. "We're up against a pretty strong lobby. It will really come down to whether members of Congress want to protect their constituents or agribusiness," said Slaughter. "I do believe the chance are good, at least getting it through the House." The bill has been introduced several times since the 1980s but has been blocked by agribusiness interests. Proponents of the ban say antibiotics are given to healthy animals over a long period of time to compensate for unsanitary and crowded conditions, and to promote weight gain, rather than to combat an illness. Does the defense by Dave Warner at the National Pork Producers Council make sense? Dave Warner, a spokesman with the National Pork Producers Council, defended his industry. He said 95 percent of antibiotics given to pigs are for preventing, controlling or treating disease. If the bill goes into effect, Warner said piglet deaths would go up, producer costs would rise, meat output would drop and consumers would see prices climb. All from reining in a practice that he describes as rare? Perhaps Warner is trying to slip the routine practice of giving antibiotics to healthy animals under the heading of "preventing" disease. See also Tom Philpott's coverage at Grist. 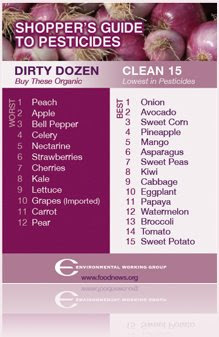 The Environmental Working Group has released the latest edition of its Shopper's Guide to Pesticides, with the "dirty dozen" and "clean 15" based on residue levels. Hanna Rosin's new article in the Atlantic follows a script that one commonly sees in reporting about nutrition science. ... and the mild claim, buried in the middle, that defeats only a straw dummy (formula is not as menacing as smoking). So overall, yes, breast is probably best. But not so much better that formula deserves the label of “public health menace,” alongside smoking. We have the belittling of important results, whose main defect seems to be disagreement with the author's story line. Kramer followed 17,000 infants born in Belarus throughout their childhoods. He came up with a clever way to randomize his study, at least somewhat, without doing anything unethical. He took mothers who had already started nursing, and then subjected half of them to an intervention strongly encouraging them to nurse exclusively for several months. The intervention worked: many women nursed longer as a result. And extended breast-feeding did reduce the risk of a gastrointestinal infection by 40 percent. This result seems to be consistent with the protection that sIgA [an element of breastmilk] provides; in real life, it adds up to about four out of 100 babies having one less incident of diarrhea or vomiting. And I think we may have an instructive misunderstanding or misquoting of some statistical results. Rosin quotes one fascinating study by Evenhouse and Reilly that compares cross-sectional analysis (showing how different breastfeeding practices for children in different families are related to different outcomes) to a within-family fixed effects analysis (showing how different breastfeeding practices for children in the same family are related to different outcomes). The fixed effects analysis has an important advantage, by controlling for confounding characteristics of the family. The fixed effects analysis also has an important disadvantage, lower precision (much bigger standard errors) because there are fewer mothers who change breastfeeding practices for different siblings. Because of the lower precision (bigger standard errors), the same estimate of the effect of breastfeeding -- such as the finding that breastfed children are lighter or brighter -- could be "statistically significant" in the cross-sectional analysis and "statistically insignificant" in the fixed effects analysis. The important thing to do, in such cases, is to look at the actual estimates to see if they are much different in the two analyses. If I am understanding Evenhouse and Reilly's analysis correctly, the cross-sectional estimates showed the usual benefits of breastfeeding for many outcomes. The fixed effects estimates agreed fairly closely on most of these outcomes, but were statistically insignificant because of larger standard errors. For one key cognitive function score (PVT score), even the fixed effects analysis found a benefit of breastfeeding. So, Evenhouse and Reilly, in their summary, have good things to say about breastfeeding. The significant correlation between breastfeeding and PVT score in our within-family model provides more credible evidence of a causal link between breastfeeding and cognitive ability than do existing nonexperimental studies. The effect is large enough to matter, and it is lasting, persisting into adolescence. Stronger evidence of causality may argue for intensifying breastfeeding promotion, particularly among groups that suffer from high rates of academic failure and other problems that some researchers have correlated with lower IQ (e.g., incarceration, poverty, or welfare recipiency). Some of the same social problems that justify additional expenditures on education and Head Start, for example, may also warrant additional efforts to raise breastfeeding rates. Our results also suggest, however, that many of the other long-term effects of breastfeeding have been overstated. How does Rosin describe what these authors say? Almost all the differences turned out to be statistically insignificant. For the most part, the “long-term effects of breast feeding have been overstated,” they wrote. Notice how Rosin quotes selectively from just part of Evenhouse and Reilly's last sentence. The rest would disagree with her story line. In conjunction with Registered Dietitian (RD) Day, U.S. Food Policy is participating in an RD Blog Fest on behalf of National Nutrition Month. Check back periodically as other dietitian’s blogs will be linked throughout the day. 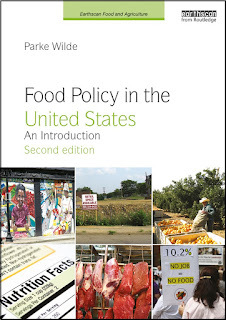 As a RD mastering in Food Policy and Applied Nutrition, I see now more then ever as the time for RD’s to fully embrace the world of policy as an agent for change. A short trip down memory lane shows us the causal story of how our food system and societal health got where it is today, all through policy. As the ‘food and nutrition professionals,’ it is imperative that dietitians understand how food is grown, why certain foods are grown, and how these policies are contributing to the very disease we are attempting to rebuke. In 1973, Secretary of Agriculture Earl Butz, encouraged farmers to "get big or get out," as he urged farmers to plant commodity crops like corn "from fencerow to fencerow." These policy shifts coincided with the rise of major agribusiness corporations, and the declining financial stability of the small family farm. Evidence shows that while the present capital and technology-intensive farming systems are productive and able to produce cheap food, they also bring a variety of economic, environmental, and social problems. Industrial farms are subsidized by commodity payments (your tax money) and are contributing to environmental degradation through: bi-cropping (corn and soy), heavy use of pesticides, inefficient use of increasingly scarce water, depletion and erosion of soil, difficulty recycling nutrients and destruction of biodiversity. Recent research has also shown a decrease in nutrient values in fruits and vegetables over the last 30 years. This alone is great reason for RD’s to be the leading soil advocates. What is infuriating is that the food that is being subsidized and grown throughout the Midwest is not really food at all, in that it is not fit for human consumption. It is an input and it must be processed, which leads us another problem: processed food. Almost every product you find in the center aisles of the grocery store is made from corn and soy. From steaks to chicken nuggets, condiments, juices, frozen entrees, pastries, etc., are ultimately derived from corn, either as high fructose corn syrup or from the corn-based animal feed that is being fed to animals. The animals confined to the industrial food system are also not supposed to eat this corn. Cows are ruminant animals and are suppose to eat grass. This is like trying to make a patient with Celiac’s Disease eat a diet of wheat gluten. The cows, like the patient would, get sick with a condition called acidosis which causes one of their four stomachs to inflate, ultimately causing suffocation. To combat this problem, the industrialized food system provides animals living in CAFO’s (Confined Animal Feeding Operations) with a low dose of antibiotics. Presently, 80% of the antibiotics in the US are used non-therapeutically in animals being grown for consumption. Those working in the community and clinical dietetics and with at-risk populations see the ramifications of these policies every day. The American people, especially low-income populations, are sick. Both corn-fed beef and high-fructose corn syrup contribute to the obesity epidemic in the United States. Those working on obesity know that behavior change alone is not working. Patients are stricken by a federal policy that makes cheap food possible. While American’s spend a smaller fraction of their budget (about 11%) on food compared to any other industrialized nation, the cheap food is catching up to us on the other end: our health care costs, or what I call, “sick care.” Another issue for those working in the area of hunger and food security is our dependency on petroleum inputs to grow food. With a new administration and a new secretary of agriculture, now is a great time for RD’s to join in the political process that is entrenched in our food. In order for your representatives to begin to change these archaic policies, they must first know that there is political will. Dietitian’s can be the story-tellers and the educators for their policy makers, communities and clients. As the nation's food and nutrition experts, registered dietitians are committed to improving the health of their patients and community. Registered Dietitian Day commemorates the dedication of RDs as advocates for advancing the nutritional status of Americans and people around the world. There is no better place to an RD to start, then in policy. What could an RD do to learn more? Learn about the Farm Bill and how RD’s can help make it a “Food Bill"
Farm Foundation has organized a competition seeking innovative and promising public policy options to address the challenges agriculture may face in providing food, feed, fiber and fuel over the next 30 years. The competition is open to anyone with an interest in the public policy issues outlined in the Foundation's report, The 30-Year Challenge: Agriculture’s Strategic Role in Feeding and Fueling a Growing World (.pdf).The Foundation intends to award cash prizes totaling $20,000. Entry deadline is June 1, 2009. Details of the competition (.pdf) are posted. Will you send me a food rule you try to live by? Something perhaps passed down by your parents or grandparents? Or something you’ve come up with to tell your children – or yourself? I will post your suggestions on my Web site and plan to include the best in a collection of food rules I’m now compiling. Thanks in advance for your contribution. Buy foods as if they were priced correctly. Just for example, if energy were priced correctly, from a long-term environmental perspective, much local food would be comparatively less expensive and much highly processed and packaged nationally marketed food would be more expensive. If petroleum-based nitrogen fertilizer were more expensive, and if hog and poultry producers were responsible for external costs, then there would be fewer factory farms and more farms would raise multiple animal products and crops in a more holistic nutrient management system. If advertising did not favor silly and less-nutritious branded products, basic healthy commodity foods would be trendy. • Nutrition assistance programs receive $20.8 billion (78% of the total amount for agriculture). Food stamp benefits and eligibility in the newly renamed Supplemental Nutrition Assistance Program (SNAP) represent the largest single increase (nearly $20 billion); benefits rise 20% on average from current levels. • Rural development receives a sizeable increase of $4.4 billion over two years (compared to a regular annual appropriation of about $2.5 billion). Rural broadband receives $2.5 billion of this, an amount that allows outlays through FY2015 that are 20-30 times more than recent annual appropriations. • Assistance for farmers totals $744 million, including crop insurance/disaster programs ($674 million), aquaculture feed cost assistance ($50 million), and farm loan programs ($20 million). • Conservation programs receive $348 million for watershed flood prevention ($290 million) and dam rehabilitation projects ($50 million). • USDA receives $250 million for its own facilities maintenance ($200 million) and computer infrastructure ($50 million). • The USDA Office of Inspector General receives $23 million for increased oversight and audits of these supplemental spending programs. • Trade Adjustment Assistance for Farmers is reauthorized. The Children's Food and Beverage Advertising (CFBA) Initiative is a cornerstone of the industry's self-regulatory efforts. About 15 companies have submitted voluntary pledges to the Initiative. Some major nonparticipants include Yum Brands (including Taco Bell and Pizza Hut) and Cadbury Schweppes (including soft drinks such as Dr. Pepper and Snapple). Because perhaps 1/3 of all food advertising is by nonparticipating companies, competitive pressure could harm companies that voluntarily try to make real substantial improvements. The Initiative has fairly lenient minimum standards for the pledges, though some companies exceed the minimum standards voluntarily. The Initiative's standards say 50% of the company's "advertising aimed at children under 12 years of age" must "further the goal of promoting healthy dietary choices and healthy lifestyles." This standard can be achieved either by accompanying the marketing message with physical activity messages, or by advertising foods that qualify as "better for you." It is not clear that physical activity advertising really counterbalances advertising for unhealthy foods. New research published last month in the journal Obesity found that activity messaging can have the paradoxical effect of increasing food consumption. People who see these messages seem to behave as if they were hungry after exercise ... but without the actual exercise. The standards for foods that qualify as "better-for-you" frequently have an "either/or" character that makes them easy to meet. For example, a product can be low in sugar, or low in fat, or low in salt, but it need not meet all of these criteria together. Foods on the list of "better-for-you" items that pass muster with the Initiative include: Lunchables Max’d Out Pepperoni Pizza, Cap'n Crunch, and Gatorade Thirst Quenchers (which are said to be "better-for-you" despite getting all their calories from sugar because they provide a rehydration benefit). Only two pledges use the same standard as the 2008 FTC report, which stipulated settings where more than 30% of the audience is children under the age of 12 years. Some pledges use a lenient standard of 50% of the audience. The definitions in other pledges are so imprecise and complex that it is difficult to determine what advertising is covered. The Campbell Soup Company proposed the following standard: “audience composition that is approximately two times the proportion of that age group in the general population (composition index of 200 or more)”. Pepsico listed five different non-quantitative factors, specifying “none of which shall be controlling." Register today to receive the $25 rate for the Tufts Friedman School of Nutrition Science and Policy's Future of Food and Nutrition Student Research Conference. The conference will be held Saturday, March 28, from 9am-5pm at the Jaharis Building in downtown Boston. Click here to register. Registration includes admission to all conference sessions, breakfast, lunch, and coffee breaks. The conference will feature oral and poster presentations from 35 students – including several Tufts students - doing research in the fields of food policy, public health, agriculture, nutrition, and anthropology. Click here full event schedule. Mark Winne- Mark currently writes, speaks, and consults extensively on community food system topics including hunger and food insecurity, local and regional agriculture, community food assessment, and food policy. He also does policy communication and food policy council work for the Community Food Security Coalition. His first book "Closing the Food Gap — Resetting the Table in the Land of Plenty", published by Beacon Press, will be available for purchase at the event. Susan Roberts- As a consultant, writer and speaker on food systems Ms. Roberts takes scientific information and translates it into policy applications linking public health, food, agriculture and food security. Recently Ms. Roberts directed the WK Kellogg Foundation Food and Society Policy Fellows Program where national fellows used media to influence food systems, agriculture and health thinking and policy. Robert Paarlberg- His latest book, titled "Starved for Science: How Biotechnology is Being Kept Out of Africa," was published by Harvard University Press in March 2008. He is currently senior consultant to a Chicago Council on Global Affairs bipartisan study group on the future of U.S. agricultural development assistance policy. He has published books on agricultural trade and U.S. foreign policy, on international agricultural trade negotiations, on environmentally sustainable farming in developing countries, on U.S. foreign economic policy, on the reform of U.S. agricultural policy, and on policies toward genetically modified crops in developing countries. Robert Kenner's new movie: Food, Inc.
It’s a terrific introduction to the way our food system works and to the effects of this system on the health of anyone who eats as well as of farm workers, farm animals, and the planet. It stars Eric Schlosser and Michael Pollan, among others, but I was especially moved by Barbara Kowalcyk, the eloquent and forceful food safety advocate who lost a young son to E. coli O17:H7 some years ago. I can’t wait for the film to come out so everyone can see it. I will use it in classes, not least because it’s such an inspiring call to action. Food and beverage industry self-regulation is commonly seen as mere window dressing for doing nothing about intense food and beverage marketing to children in the midst of an epidemic of childhood obesity. Yet, many economists support government interventions to address the problem only if they are narrowly tailored to solve "market failures" -- situations where the market system fails to serve the public interest. If the market's own response suffices, it may be preferable to the government response. And, many legal experts like restrictions on advertising only if the restrictions are narrowly tailored to be "no more extensive than necessary." Of course, companies themselves prefer self-regulation. With these multiple sources of support, the federal government has determined to attempt a period of self-regulation. The questions that interest me most are: (1) how will this period of self-regulation be evaluated? ; and (2) if the self-regulation fails, will the economists and legal experts follow the logic of their own arguments and support a stronger government response? My longer version of this discussion has just been published in Nutrition Reviews (contact me by email if your library lacks access). Kim Severson and Andrew Martin take up this question in the New York Times this morning. But many people who pay as much as 50 percent more for organic food think it ought to be. Now that organic food is a big industry, with big companies on a national scale, the distinction between organic food and conventional food should be understood precisely as the list of food qualities protected by the federal government's official definition of organic. This list includes a restricted menu of permitted pesticides, no GMOs, and several other qualities that are important to many consumers. Because increased pathogen monitoring is not one of the elements of the official definition, I would expect modest but not dramatic food safety advantages from food certified as organic. Theodore Seuss Geisel, pen name 'Dr. Seuss,' was born on March 2, 1904 in Springfield Massachusetts which would make today his 105th birthday. While I enjoyed many of his 60 published children's books as a child, (Green Eggs and Ham, The Cat in the Hat and One Fish, Two Fish, Red Fish, Blue Fish), it was not until I was older that I truly appreciated the charm of Dr. Seuss. "chronicles the plight of the environment and the Lorax (a mossy, bossy man-like creature), who speaks for the trees against the greedy Once-ler (industry)." The tale is a major environmental fable that speaks of the destruction of the environment through the eyes of the Lorax, who is the protector of the Truffula trees. The Lorax watches on in sadness as his home and habitat get destroyed by an industrial business. As the business continues to pillage the environment, killing the plants and animals and leaving a polluted wasteland, the Once-ler comes to his senses, realizing his gaffe. Once-ler is now at the mercy of the Lorax to restore the beauty and sustainability to the land by replanting the last-ever Truffula seed. Cross posted from Epicurean Ideal. The Rudd Center for Food Policy and Obesity has a very timely report on soft drink taxes (.pdf). An engaging section at the end offers point-by-point contrasts between what "opponents" and "proponents" say about soft drink taxes. Here are some examples and my comments on them. Soft drink taxes are regressive. They will disproportionately hurt the poor and minorities who spend a larger proportion of their income on food. -- may be more sensitive to higher prices and therefore stand to benefit most from reducing consumption. offset concerns that the tax is regressive. To make the proponents' point even more broadly, it is good public policy to expect the tax system as a whole to be progressive, but it would be bad policy to expect every disaggregated sales tax to be progressive. The government should stay out of private behavior. It should not try to regulate what people eat or drink. The government is already deeply involved in what we eat, from farm subsidies to setting nutritional standards for school meals. Historically, major government interventions have been successful in improving and protecting the public’s health. Examples include smoking restrictions and tobacco taxes, mandated seat belt usage, fluoridated water, and vaccinations. It is true that government interventions can promote the public interest. However, on this question about personal food and beverage choices, I'd encourage the proponents to listen very carefully to the opponents' concern. The proponents should spend more ink calling for reforms to misdirected government policies (such as subsidies for inputs to corn sweeteners) than calling for taxes to change public behavior. Public policy to address obesity wins more public agreement when the public strongly senses a heartfelt deference to consumers' own preferences. Here is a rhetorical argument that proponents can pursue in states where sales taxes are lower for groceries than for other goods: "Soft drinks should be taxed fairly, just like all other consumer goods subject to sales tax. Soft drinks should not be taxed using the special lower tax rate for food necessities. This policy reform does not tell consumers what to do. It merely puts soft drinks in the appropriate category of goods subject to sales tax." In such states, proponents should never get caught in a sound bite that makes them seem more eager to direct consumer choices. Soft drink taxes can’t be compared to cigarette and alcohol taxes. The use of tobacco and alcohol can have adverse consequences for non-users (for example, second hand smoke, and drunk driving accidents, called “negative externalities”). This is not true for soft drink consumption. Obesity also has negative externalities which affect us all. Among them are significant overall health care costs, including higher medical, disability, and insurance premium costs. For example, obesity-related medical expenditures were estimated in 2002 to be $92 billion, half of which were paid for with taxpayer dollars through Medicaid and Medicare. The proponents, here, have chosen an argument that may be too broad to win public agreement. By the same argument about shared insurance risk pools, one could justify fairly severe government interventions to influence personal choices that affect health. Contrast this argument with the much stronger public appeal of policies to protect children from soft drink sales and marketing in schools. At the end of the day, I'd support much stronger public policies to address soft drink consumption and obesity, but the proponents' arguments in this report could be strengthened with some pruning.